The Session #67: How many breweries? I’m late. A summer break that was well overdue, led to relaxation of body, mind and fingers to keyboard. My first missed deadline and I think serendipitously so as it turns out as the topic of this month’s ‘Big Session’ is about the future of the US craft market – where will it go and specifically how many breweries will there be a few years from now? Fortune favours the procrastinator. Just as I experienced my first writers block – unable to find an interesting angle into the topic without covering old ground, so our good friends at CAMRA’s PR team spring into action to announce that in the UK, we have just passed the 1,000 brewery mark for the first time in donkey’s years*. An interesting juxtaposition. The night before I heard this, I had attended leaving drinks with a former colleague at the large brewer we had both worked for. She was skating through the room with delight and expectation to the new challenges ahead. Lovely though this was to see, less so were the cold, grey faces on others left behind (apparently this all changed later on when Shots got involved). They seemed battle scarred and weary through years of long hours trying to turn round a business sailing towards a maelstrom whilst fending off all the non value added dross that goes with working in big businesses. Declining beer consumption; much-hyped strategic initiatives around such glossy topics as promoting beer for women, grand trumpetings for major relaunches… all broken and scattered like the flotsam and jetsom washed up on the rocks from a shipwreck, tempted by the wreckers’ false lights to the shore. Yet British brewing – ale brewing, small-scale, round the back of the pub, in the garage, an industrial unit brewing…well that’s something else. Since I lifted my head back above water and began to see the beer category as a drinker again, it’s shocked me how it feels in rude health. New breweries opening, a mad new name for a beer to conjure with every week, an amazing range on sale in a supermarket – both domestic and foreign beers. The big boys and ‘craft’ boys are like gypsies with daggers; tied at the hip, reticent to reach into the others’ fight space ifor fear it will be the last thing they do. Brewery numbers here and across the pond is rather like the Olympics medal table: despite our geographical compactness and rather miserly 60 million inhabitants the UK now has 1,000 breweries. The U.S., for all of its 360 million good folk, has only 1,989. So whilst we can enjoy the moral highground on this particular score, the reality is we should enjoy the fruits of our brewers and our brewsters while we can. 1) Despite the growth in breweries, the hard reality is that people in both countries are drinking considerably less than they did 5, 10 years ago. And within this, the mix is changing. Both markets are still seeing the growth of wine (albeit this isn’t as inexorable as it seemed a few years back), mass produced ciders, particularly over here, but even now in the US and a spirits market that is fighting back after a torrid couple of decades. 2) The real competition, the reason why CAMRA are now slowly but certainly moving their focus to saving our pubs, is the rise of the coffee shop. Drawing in consumers from dawn until dusk for the inexpensive treat that used to be the sole realm of alcohol. With a decreasing amount of disposable income in our pockets nowadays it’s going to continue to have implications. 3) Supply and demand. There is excess brewing capacity in the UK yet new starters are building new breweries, and to a lesser degree new packaging lines at a rate of knots. The rate of craft brewery failure is less publicised but look carefully and there they are. Small companies, launched on such optimism and belief yet over-stretching themselves by building assets wanted but not needed. 4) The big boys will take note and they will act. 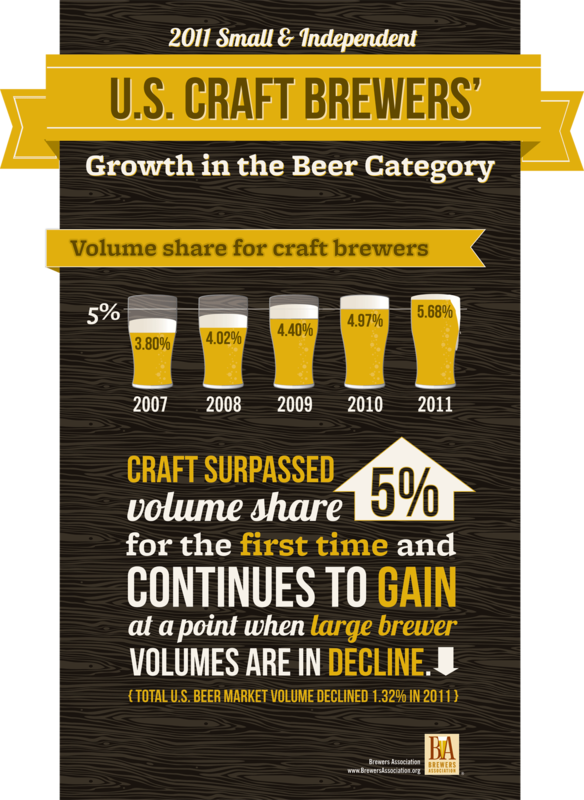 What’s the biggest ‘craft’ beer in the US? Boston Lager? Sierra Nevada Pale Ale? Brooklyn Lager? Nope – Blue Moon from Miller Coors. You may argue it doesn’t count – it’s not a ‘craft’ beer. But the drinker isn’t bothered. Blue Moon looks like a craft; and it smells like one. By God, it must be one. And frankly, Keith Villa is a lovely chap and we know where his heart is really, so it’s all OK. Isn’t it? Well Molson Coors are small fry when it comes to the real boys in town: take Anheuser Busch Inbev not only developing their own brands but investing in crafts. I know: I bought some Goose Island only today from a Waitrose. Don’t get me wrong. I’m not a doom-monger. I’m loving what’s going on in beer at the moment – and I’d probably re-mortage the house to start a brewery if I thought Mrs P wouldn’t butcher off my dangly bits and feed them to her mother’s Jack Russell, but those who are pro beer, pro taste, pro the individual taking on the behemoth…well let’s be prepared and make sure we build great beer brands, not just great breweries. *It’s over 70 years apparently, which by my crude maths takes me to 1942…the War…you know, know the best time for breweries you’d think? In fact, weren’t some nationalised?? Author David PrestonPosted on September 7, 2012 July 2, 2014 Categories Brands, The SessionLeave a comment on The Session #67: How many breweries?